Brand: Kencraft Candy KC-8054P Units: 6/pkg. Dimensions: 1⅛" wide x 1" long x ⅜" deep Edible sugar decorations made from royal icing. Add to cupcakes, cookies, cakes, candies, and more. 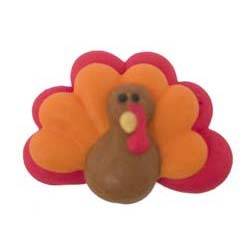 Edible sugar decorations made from royal icing. Add to cupcakes, cookies, cakes, candies, and more. Ingredients: Sugar, Corn Starch, Dextrose, Egg Whites, Monocalcium Phosphate, Propylene Glycol, Alginate, Salt, Artificial Flavor, FD and C Red 3, Red 40, Blue 1, Blue 2, Yellow 5, Yellow 6.